Kristin Mackey, a motivational speaker, author of two books, leadership/employee engagement expert, and Shawn Herbig, President and Founder of IQS Research, announce the release of the new book Frequency Matters™, Be a Contributor, Not an Employee!, a new book written for the executive, leader and team member who aim to create and sustain a visionary culture. It features expert advice from CEOs, entrepreneurs, designers, engineers, management consultants, educators, IT professionals and HR leaders. Frequency Matters™, Be a Contributor, Not an Employee! by Kristin Mackey and Shawn Herbig, new book on employee engagement. "Kristin and Shawn do a wonderful job of making leadership wisdom both accessible and fun” – Chris McChesney, co-author of The 4 Disciplines of Execution, 4DX, a The Wall Street Journal #1 Business Bestseller. Kristin Mackey, a motivational speaker, author of two books, employee engagement expert, and Shawn Herbig, President and Founder of IQS Research, announce the release of their new book Frequency Matters™, Be a Contributor, Not an Employee!, a new book written for the executive, leader and team member who aim to create and sustain a visionary culture. It features expert advice from CEOs, entrepreneurs, designers, engineers, management consultants, educators, IT professionals and HR leaders. The book’s findings pull from a curated list of 20 unique voices, successful leaders each offering their perspective on how to create a high performing team. “When you are interested in your work, you tend to put in more effort and care about the final outcome. When teams care and put in more effort, this usually leads to better ideas and solving problems,” says Peter T. Boyd, General Guru at PaperStreet Web Design, a lead contributor. Diverse examples include a company where a typical work week is 35 hours, and another company where it is 70 hours. The common theme is that these corporate leaders have aligned their culture and their team around a single vision that works for them. Frequency Matters™, Be a Contributor, Not an Employee! is a book on the power of personal alignment, collaboration and making contributions that have an impact. 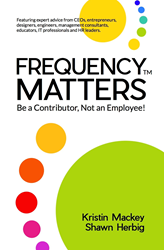 Frequency Matters™, Be a Contributor, Not an Employee! - Now available on Amazon. Kristin is a motivational speaker, author, and artist with over 20 years’ experience in employee engagement and organizational transformation. She has appeared in various media outlets, authored "You Can, You Will, You Did," and is part of the FranklinCovey Speakers Bureau. Shawn is the founder of IQS Research, a firm that brings engineering precision to social science problems. He is driven to use data and insights to create better leaders, better businesses, and better communities.